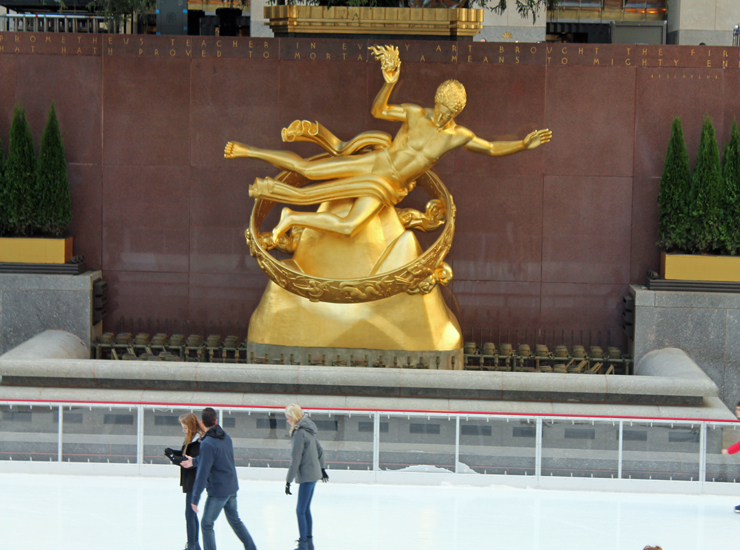 Rockefeller Center is a national historic landmark in the heart of Midtown Manhattan. Right up there with Empire State Building and the Statue of Liberty. It is amazing to see during Christmas time. I love watching people ice skate on the rink. It just pits a smile on your face. There is also an observatory at the top of the building, which we didn't visit this time. Since this place is so well known in NYC, the place is very crowded. There are so many visitors/tourists at times, it will be a short wait to take photos so that not many people are around you in the photo. Luckily, there are many benches around the area that you can sit on to rest at. The area is very well maintained and clean. Lots of stores to check out in the area and across the street is Saks on Fifth Avenue if you want to do some shopping. Regardless of your feelings about the big crowd, this building is a must when visiting the Big Apple. 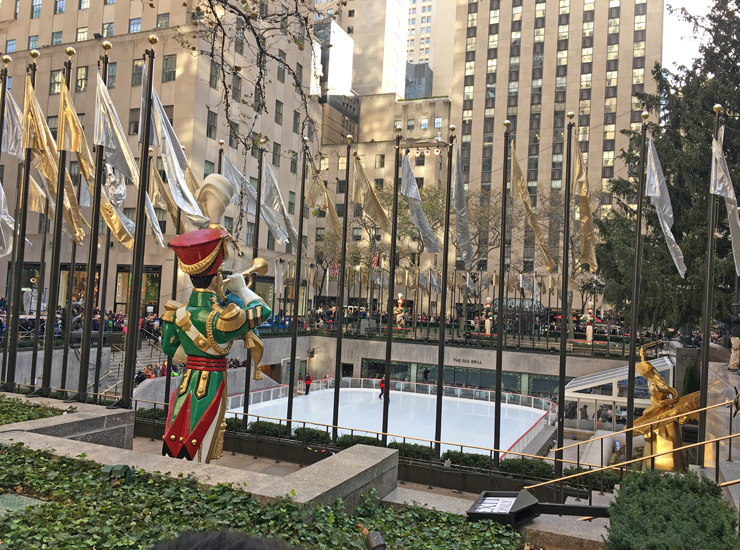 The Rockefeller Center is beautifully decorated walkway, gaze at the ice skaters below, and watch the light display across street at Saks 5th avenue. Rockefeller Plaza is become more famous by holiday movies : From Will Ferrell twirling on ice in Rockefeller Center in 'Elf' to Macaulay Culkin scampering through the Plaza in 'Home Alone 2,' NYC is the snow-dusted setting of numerous holiday flicks. Christmas crowds bustle and tussle through Bloomingdale as a pair of gloves squeezes its way from the back room to the sales floor. Is it fate or "Serendipity" that causes Jonathan Trager (John Cusack) and Sara Thomas (Kate Beckinsale) to reach for them at the same moment. I would highly recommend visiting the center during the holidays, in the morning and at night with family. And also, I would love to ice skate at the center hopefully in the near future. 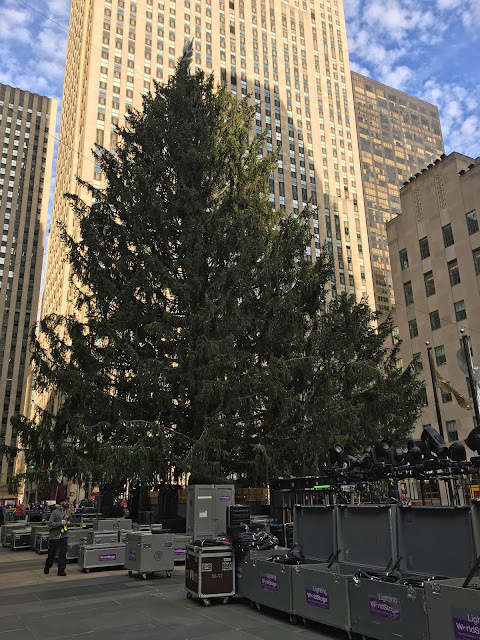 The most magical time of the year is when you step into the Rockefeller Center area to view the largest holiday tree. 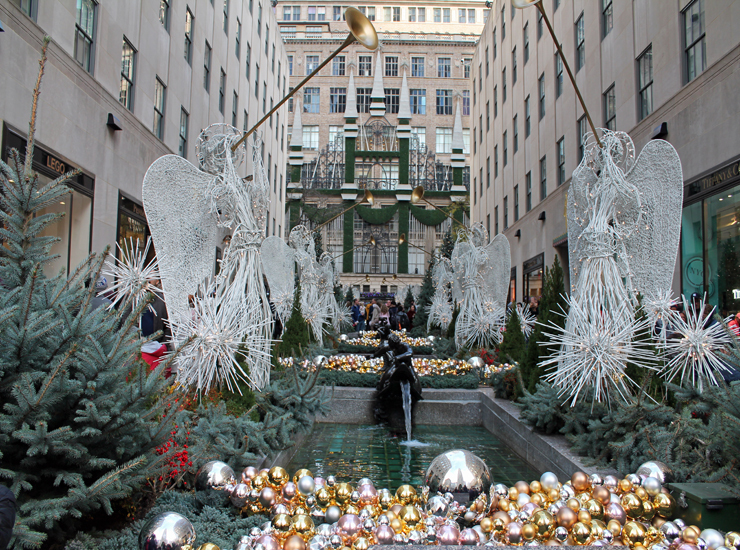 These 12 luminous angels that line the Channel Gardens in Rockefeller Plaza during the holidays add that touch of splendor that completes the scene. To be actually here and see that massive Christmas tree during the holidays is an amazing experience. I've always wanted to visit New York during the Christmas season. It hasn't happened yet but one of these days I'll make it during the most magical season of all. Rockefeller Center at Christmas will be a must-see for me. New York City has so much to offer it requires a lot of walking but its so worth it. Considering the experience and fun you will have. Oh yes, there is no place like NYC around Christmas time. They go ALL OUT down there and Rockerfeller is absolutely beautiful. I did see Rockefeller Center at Christmas many years ago, as a child. 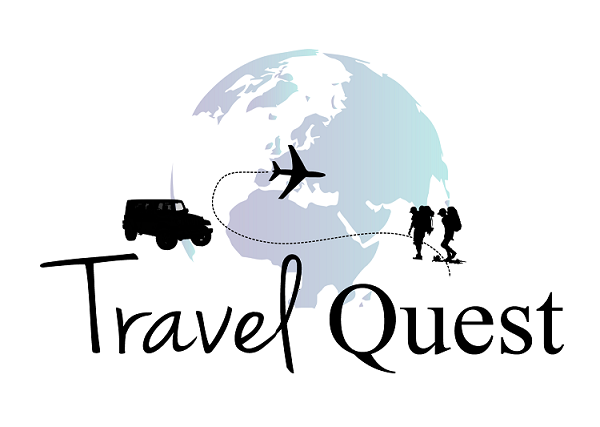 If you're in the city or travel in it's definitely a site worth considering since it's a landmark. Christmas is the most visited time in NYC be ready for the big crowd . 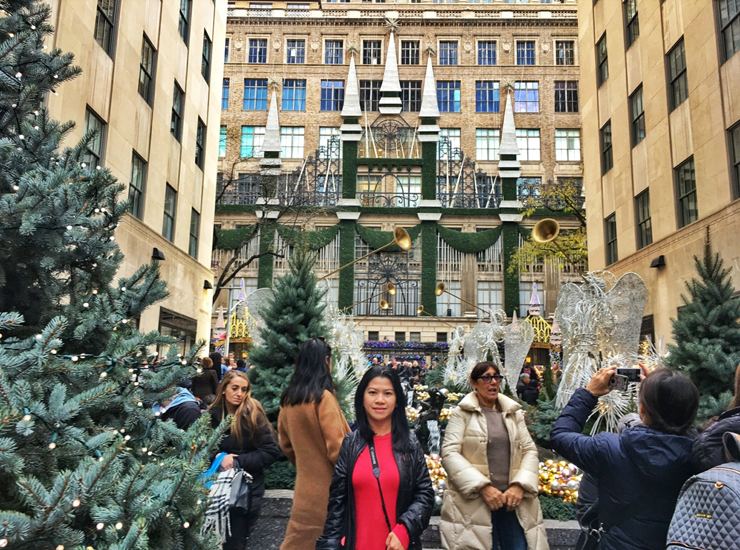 Only ever seen Rockefeller Center in movies or around the holidays. Always decorated so pretty and always tons of people. I have never been to NYC and I have only seen it on TV. 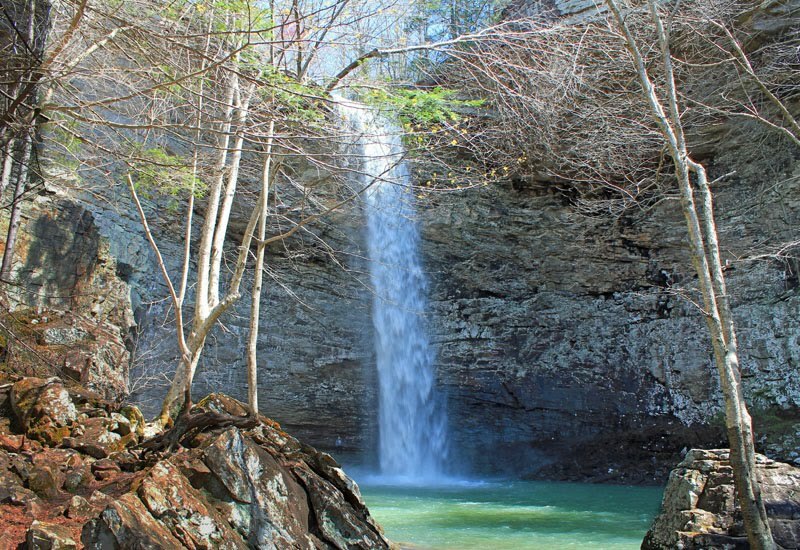 I really want to go there just once. I think it looks absolutely magical. The time and effort that they put into the decorations is just stunning. It's different when your physically there seeing those high buildings and bright lights priceless. I was awe the whole duration of our trip. I have always wanted to go to NYC for the holidays. One day, I hope. I need to see that tree in person and the decor, because it is all incredible. I spent the first week of December in NYC and I love New York during the holiday season. 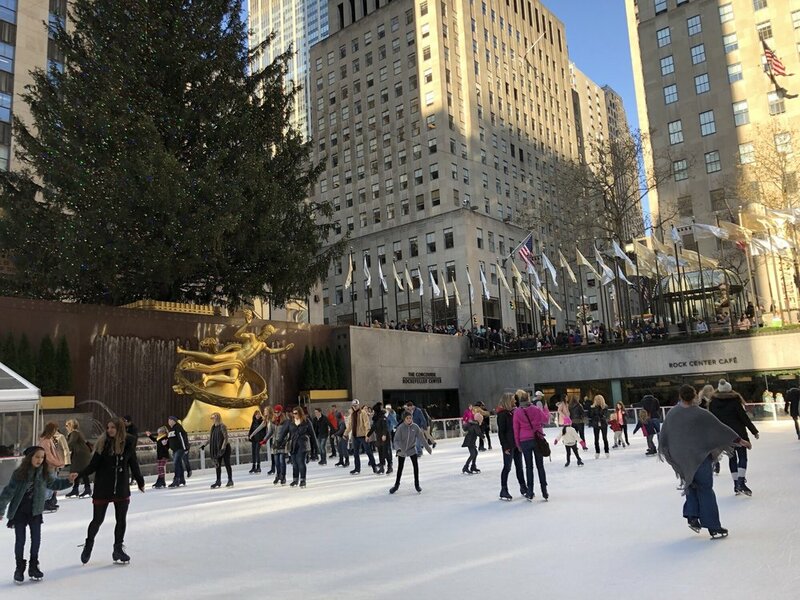 I went ice skating at Rockefeller Center and it was so much fun. Thanks Angelic , I promise myself next time I have to try ice skating. I'm glad you had a great time at the Big Apple. My sister and I went to Top of the Rock last summer but it was so humid we couldn't see as far as we had hoped. It's a gorgeous view. I have been to Rockefellar center once. It was amazing! I want to go back one day, when the tree is lit! I was there when they were in the process of stringing the lights on it. 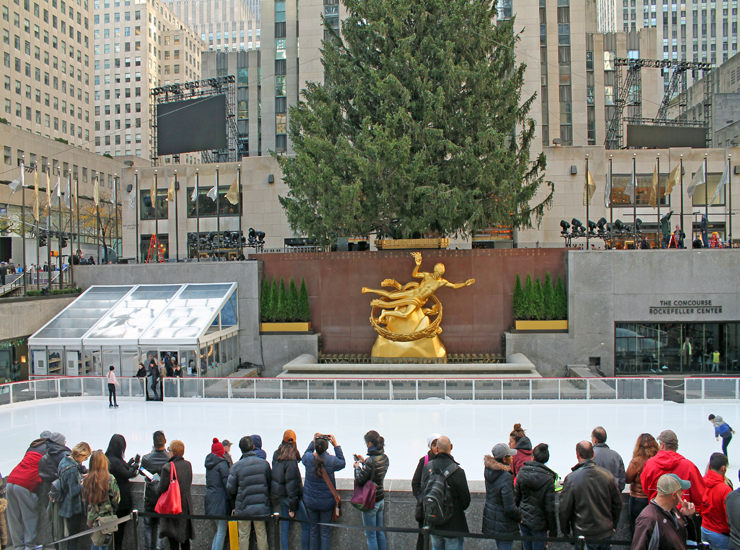 I bet that it is amazing to see Rockefeller center at Christmas. I know that tree is just beautiful. Yes indeed Lisa breathtaking, before I only see the Big Tree in the movies, so surreal. It has been a while since I visited Rockefeller Center. It is certainly magical during some times of the year. I miss the ice skating rink. I love Rockefeller Center. It's definitely a place to visit when you are in New York City. Skating there sounds fun. I've seen it on tv. Maybe one day I'll get to see it in person. I'm from the west. I've been to Florida but never farther north on the east coast than Georgia...so I've got a lot more of the United States to see. Traveling to one city to another is indeed a great experience. NYC is a place you have to visit at least ones in your life. 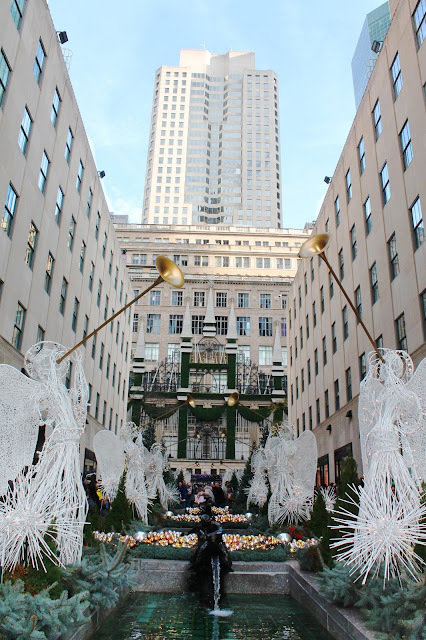 I have never been to Rockefeller center at Christmas time, it has always been something I want to do. I love the decor, the tradition of it and at night with the lights it all looks so magical. 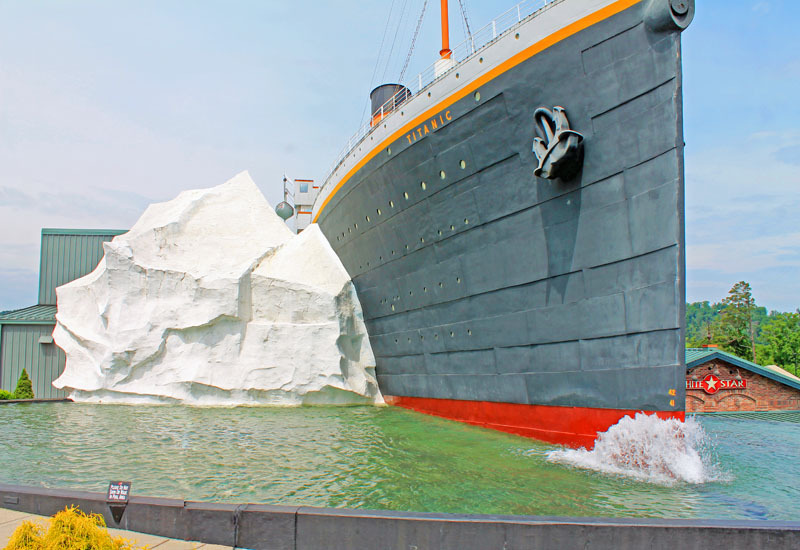 This would be fun to go and see! Christmas is my favorite holidays and to be actually spend it to NYC feels like I am dreaming. RFC is such a fun place to hangout. There is a ton of stuff to do. I haven't been to Rockefeller Center in a few years. I always have an awesome time. My wish is to be able to visit the Rockefeller Center. I only see it in magazines and see it on TV. It must be one awesome place to be in NYC! You got to see it, for sure you will have a blast! I was in NYC for a short trip a few months back and I missed out visiting the Rockefeller center! I must remember to do so the next time I am there. It truly looks magical. I will be sure to check that out when next I visit New York. Thanks for sharing!